[Note: This article is on the older 2011 Seminar on Career and Higher study options after A/L. Please visit here for 2012 Seminar. 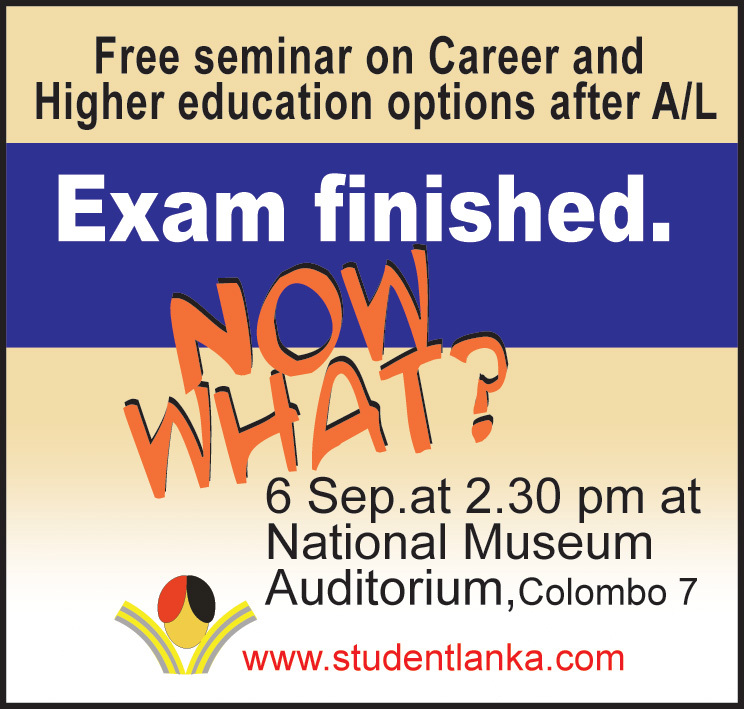 A free seminar on Career and Higher education options after A/L will be organized by studentlanka.com web site, in collaboration with Young Biologists’ Association, Sri Lanka for those who have completed GCE Advanced Level examination in 2011 August. Aim – to give accurate and unbiased information on selection of degrees, courses and careers after GCE Advanced Level examination, especially if you are not selected to a course in a National University. This will be held on 6 September 2011 (Tuesday) at 2.30 pm at National Museum Auditorium, Marcus Fernando Mawatha, Colombo 7. Prof Hiran Amarasekera, Professor at University of Sri Jayewardenepura, Nugegoda. Patron of Young Biologists Association. Dr Sujatha Gamage – Sujata Gamage, PhD, is a scientist who specializes in knowledge management. She heads the Knowledge to Innovation project at LIRNEasia. Previously she has served as the Director General of the Tertiary and Vocational Education Commission of Sri Lanka. Her consultancies include a “Faculty Quality Report” for public university system in Sri Lanka and the “Corporate Plan for 2003‐2008” for the University Grants Commission of Sri Lanka. J Charitha Ratwatte – Mr. J. Charitha Ratwatte Jr. has five years’ experience in the software industry in Sri Lanka. Charitha earned an MBA from the Stanford Graduate School of Business in 2009 with concentrations in the Public Management and Global Management Programs. Charitha co-founded and leads Rural Returns (Guarantee) Limited in Sri Lanka, a non-profit company that addresses rural poverty. He volunteers with SL2College, a volunteer-driven organization dedicated to connecting students with free, high-quality advice on higher education options.